This is what I learned from watching It’s The Great Pumpkin, Charlie Brown way too often. 2. Jumping into a pile of leaves with a wet sucker is a bad idea. Tried it once, turns out, very bad idea. 3. 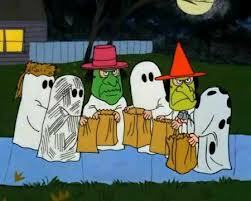 Charlie Brown should have gotten some candy at Halloween. I wanted to give him some of mine, what about you? 4. Pigpen, the child who walks around in a cloud of dirt is more likable than Charlie Brown. 5. If someone moves a football each time you go to kick it, Good Grief, stop believing them, it’s a theme. Same goes for many situations. 6. A person can have moral standards. 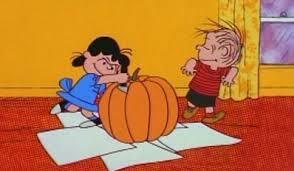 Sally agrees to sit in the pumpkin patch with Linus, but threatens to slug him if he even tries to hold her hand. 7. 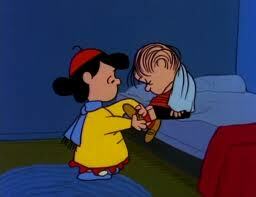 Lucy actually cares about her little brother, Linus (even more than their parents). She goes and gets him from the pumpkin patch at 4am and sweetly puts him to bed. She gets him extra candy while trick or treating. It’s a whole other side of Lucy. 8. 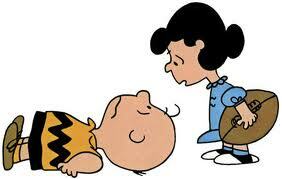 Charlie Brown is a hopeless optimist. No matter how people in his ‘community’ ignore, hurt, or bully him, he keeps believing and keeps trying. Or maybe he just has low self-esteem. 9. Dogs like to dress up as World War I Flying Aces for Halloween and fly around on their Sopwith Camels aka dog houses fighting the Red Baron. Who knew? 10. A signed contract doesn’t always mean what you think it means, there could be a loopholes. 11. It’s ok to give a child rocks for Halloween instead of candy. I’ve never tested this one. 12. 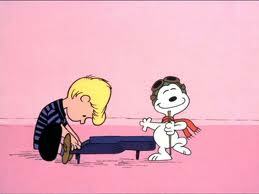 Schroeder was a talented little dude, I always hoped he’s make it big until I realized he was just a cartoon, then I still hoped he’s make it big. 13. 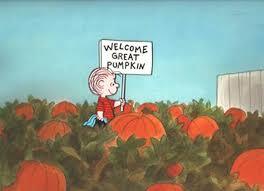 Linus wrote to The Great Pumpkin saying everyone tells him TGP is a fake, but he believes in him. He adds if TGP is a fake he doesn’t want to know. Is this denial or trying to hold onto his beliefs? People do it all the time, with politicians, God, family members, spouses, etc. Even if we know something is not true or wrong, we often don’t want to know. I guess that’s why we love the sweetness and gentleness of things like Snoopy cartoons. We remember fondly those times when things were simple, when you could believe, trust, and hope. Life has become complicated. Peanuts is simple fun. I didn’t know she was gonna kill it either! This is a great cartoon! Charie Brown should get some Halloween Candy but didn’t… that’s so sad because he’s a real nice guy… Even Pigpen is liked more than Charlie Brown, and that doesn’t seam fair to me. Much more things go on in this show, but it’s a great show to watch for Halloween…. I had to click on this one. BEST. HOLIDAY. SPECIAL. EVER. I like those Great Pumpkin lessons. Thanks for visiting my blog. Thank you for all the links in your post of today. Especially this one. I’m giving you a shout out on my blog tomorrow. Happy Halloween hugs! I loved your Three Things Serial and it will make a great ebook and we understand pressure and daunting tasks, take your time, with this ebook and Bloom and GM, we’ll still be here waiting. Thanks, it’s an older post, I’m practicing “Press This” to recycle some older posts (probably won’t leave it up) and I thought, Happy Halloween!!! You’re right about ITGPCH showing Lucy’s more caring side (#7). She even takes a moment to help Sally on with her costume. Re:#13 – Remember, in the other Peanuts short it is Linus who is the religious one. So yes, it says a lot about belief, faith and religion…. This post is so very worthwhile to rerun, Donna. Pos-i-lutely profound, poignant, and purely perfect. And #13 finished it, rounded it, crowned it so well. Wishing you a nifty November. Mega hugs! Thanks, I was having some fun on Halloween, avoiding candy (oh who am I kidding, only avoiding it because I hadn’t gone to the store until today 50% off candy). We don’t get trick or treaters because of the layout of our street. I’m probably going to delete this post though (not the original, I was just practicing “Press This” because I have a few older posts I want to recycle).